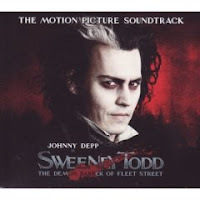 When I saw a little clip not long ago of Sweeney Todd: The Demon Barber of Fleet Street, my jaw literally dropped when I heard Johnny singing! I sure hoped it was more than a couple of minutes. Okay, I knew nothing of the musical before this so it was all new to me and I have no comparisons to make to the original. I don't honestly care about comparisons. I've read a couple of critical reviews already saying his voice, and others, are thin on the soundtrack. Thin. Hmm... I'm really very critical about music and voices myself, and I was in constant awe of just how well he did with the part. He's an actor, not a singer. Okay, he was into music before acting. Still, he's not a trained singer as you get in most musicals. Neither is Helena Bonham Carter. And Sondheim musicals are particularly not so easy to sing. The parts were complex, with quick tempos and battling duets, but they were brilliant. What do you get when you put an actor into a singing role? You get an acted musical, not only a performed musical. Johnny acted this singing role so perfectly, I was honestly on the verge of tears now and then and I did have goosebumps -- not because of the story line, but because of the performance. All of the performances were good. His was exquisite. It is rated R for violence and sexual inuendos, and of course with the story line it is graphic violence, but it's not overly distasteful. It's "Hollywood graphic" more than "reality graphic" and I much prefer that. A "horror wimp" like myself got through it with no big issues. There were times I was chuckling out loud and times when I was trying to help "write" the plot in my head (career hazard, I suppose), but in general, I was completely drawn in and full of nothing except the incredible film invading my thoughts. That's hard to do. Few films hold my attention that well ... well enough to shove aside my list of everything I should have been doing in order to be truly focused. This is a must see for those who love pure expressive art, as it is a true rainbow blend of all of the arts at once. Now to find the soundtrack. And I'm hoping to find time to see it in the theater again. "If a man does not keep pace with his companions, perhaps it is because he hears a different drummer. Let him step to the music he hears, however measured or far away. ~ Thoreau"
Let's face it, being an artistic type isn't exactly a well-understood trait. We see things differently, and others see us differently. This is something I, as an artistic type, have struggled with for many years. All adolescents have the difficult journey of trying to define themselves, but add to this the hundreds of stories rushing through your brain that you know are a real part of yourself, or the way you look at a tree and see not only the tree, but the structure, lines, grace, blending of colors and shadows that cause you to stare until those around you begin snickering. We different drummers get used to the snickering as we grow and become more comfortable with ourselves. We may not get used to dealing with the attitudes from those who don't understand. These few words echo through my mind and soul whenever the attitudes crash around me. They have reverberated often enough and deeply enough by this time to have become part of me, even though they are not my words. This is what I hope to achieve with my writing: to say something that makes enough difference to readers that it reverberates through their souls. The plaque, simple and unbecoming, has an honored place in my den. Others have no need to realize why it hangs where I can see it when I look away from the monitor, struggling with words and wondering at the logic of following the artistic life. It reminds me to keep marching to my own beat and remember the value of a few words. When I started showing the cover of Rehearsal: A Different Drummer to a few people for their opinions, one of them asked why it showed guitars when the title was about a drummer. With the quote above, I suppose it's easy enough to know why I did, but readers of course wouldn't have the advantage of reading the quote and my thoughts about it first. It is about drummers ... about different drummers who don't all happen to play the drums. It's about the arts and artists: the oddities, the sacrifices, the misunderstandings, the need to follow a personal path despite outer opinion -- and it's about the way all of those things affect and change us and those around us. The cover is more appropriate than I can explain right now, with three more of the series to come, but there is a point to what looks like a title that doesn't fit the image. It does. It's a bit of foreshadowing. As I'm working on ideas for the cover of the second of the series, the quote I'll be taking the title from will also be in my thoughts, although that may not be apparent, either. he would keep it in port forever." It's a Twelve Days of Christmas Give-Aways raffle from LKHunsaker.com! LK Hunsaker, literary romance novelist, is celebrating Christmas by giving arts-related gifts to readers. To enter, email your name and general location to ElucidatePublishing[at]yahoo.com and list your favorite fiction genre or your favorite novel. There will be a random winner drawn each day beginning December 14th and ending December 25th, so be sure to have your entry in before 6 pm (Eastern US time) on the 14th! Winners will be emailed and asked for their mailing addresses (info will not be shared in any way). In January, all entrants will be sent an invitation to subscribe to LK Hunsaker's newsletter, which can be either accepted or denied. One each of prizes 12 through 9 will be given to every winner. Prizes 12 through 5 will be mailed before Christmas. Prizes 4 through 1 will be mailed shortly after the New Year. Labels are mailing labels personalized with winner's name and address and theme of choice. Winners will also be posted daily at http://www.myspace.com/lkhunsaker Please say in your email if you do not want your last name used! Family members of LK Hunsaker or Elucidate Publishing staff are not eligible to win. Good luck! Feel free to pass this email along to friends or post in any reader gathering spots.